This is a great article, from Strong Towns, about creating a “sense of place” in your community. What are some of the things we can do to create a sense of place in downtown Fremont? Quint Studer is a Strong Towns member, a resident of Pensacola, Florida, and the author of Building a Vibrant Community: How Citizen-Powered Change Is Reshaping America. Today he is sharing a guest article on the benefits for communities of cultivating a distinctive sense of place. If there’s one thing I’ve learned on my journey it’s that sameness inspires no one. Different attracts, excites, and engages us. This is true of residents and tourists alike. No one wants to live in a place that’s just like every other place, and there’s no reason for anyone else to visit it, either. This truth should be driving your development. No one comes to a town for a wonderful mall or a highway lined with big box stores. Don’t get me wrong; residents may use these things and find them valuable—but we also need fun, lively, walkable, livable downtowns. We need quaint shops. We need locally owned restaurants. We need cool architecture. We need character. The less you look like everyone else and the more you look like yourself, the better off you’ll be. In fact, creating a distinctive sense of place is your competitive advantage. 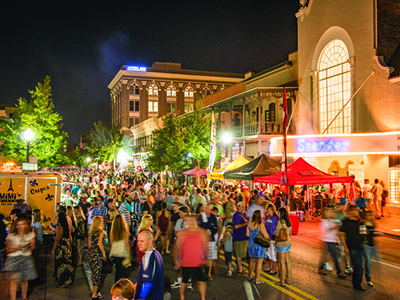 When a community’s leaders keep their focus on creating a unique place that people want to be, the local economy tends to thrive. Businesses want to move in. Young people don’t have to leave to find jobs. The best talent flocks to such communities. When you cultivate a sense of place, not only will citizens spend their dollars at home, you’ll attract tourists as well. They’ll have a good time. And because you’re giving them something to talk about, they’ll come back—and they’ll generate great word of mouth that makes others want to visit, too. Visit other places that are hopping. Notice what they did, but don’t try to replicate it exactly. Do your own version. Borrow their smart ideas and their projects if they fit, but infuse them with a sense of your unique culture. Take a good hard look at your downtown. How can you make it more vibrant? Is it walkable? Is there a great intersection that residents and visitors perceive as the center of life and activity in your downtown? Are there plenty of great places to eat and shop? Are there plenty of things to do, day and night? Are there cool living spaces to attract both young people and empty nesters? Make sure people have a reason to come downtown (programming). Often we think too big with programming, but events don’t have to be expensive. Just make them specialized and unique, not “canned.” If you’re famous for blackberries, throw a blackberry festival. If you’re on the coast, have a shrimp boil. Themes are good. If your town is health conscious (or wants to be), connect to the healthy living movement with a farmers market, a slow run, bike rides, and so forth. If you have lots of local artists, hold an art walk. You could have a series of art events with a different theme each time: watercolors, sculpture, music, art that reflects local culture, etc. The more you can repeat the events year after year, the better. If people have a good time, they’ll come back. Know your story and tell it in a meaningful way. How can you immerse people in the experience of what makes your town unique? Take a cue from other towns that have done this. Hershey, PA, is known for the Hershey Company, and it has built its whole identity on a “chocolate” theme. There’s even a candy-themed amusement park, and the downtown streetlights are in the shape of Hershey’s Kisses. What is your town known for? Maybe it’s a crop like apples or blackberries, or a product like furniture, or a famous singer or historical figure. Think a little deeper than the obvious. In Pensacola we do have beautiful sandy beaches and the Blue Angels, but we’re a lot more than these attributes. We also have a rich maritime history that draws a lot of tourists to our area. We have a fascinating multicultural heritage. And we have an incredible downtown that attracts day visitors who want to visit our shops and restaurants. All of these are elements of the story we’re always telling. Assess what you have. What can you preserve instead of rebuilding? Are there old buildings that could be repurposed? People love to work, eat, shop, and stay in renovated factories and warehouses. Old buildings have a sense of character that’s hard to replicate. Think about what’s missing. Do you need a great hotel downtown? Do you need a coffee shop or a craft beer brewery? Do you have a great university (or at least a piece of one) in the heart of the action? Connect the dots with the resources you already have and figure out how to get the right kinds of businesses into your downtown. Get creative about helping entrepreneurs who have great ideas. Consider holding a small business challenge to spark new local businesses. (Click here for a Forbes article on how we did it in Pensacola.) Get creative with financing: One idea is to charge rent that moves up and down based on revenue, which eliminates some of the risk entrepreneurs face. And remember, it’s not just about getting businesses started but keeping them successful over time. Make sure they have access to ongoing training in leadership and other crucial skills. When seeking outside investors, make sure they’re right for your community. Will that new business add to or detract from the unique story you’re trying to tell? Will it contribute to making a vibrant, distinctive place or will it detract from this goal? Will it create traffic congestion? What will be the economic ripple effect on other businesses? Be careful about who you let in. If you have the courage to say no to the wrong investment, the right one will eventually show up. Remember that little things mean a lot. One of the best things I’ve learned from Strong Towns’ president, Chuck Marohn, is that small fixes can make a big difference. Just like a fresh coat of paint makes a home look new again, planting some trees or repairing a dilapidated landmark can have a huge impact on how your community looks. Green and clean matter. And first impressions count, so make sure your community has a good “front door” like a gateway or attractive sign to welcome visitors. Finally, make sure citizens are deeply engaged in your plans. What you’re trying to build won’t work unless the community as a whole is on board. So communicate, be transparent, and invite feedback and ideas at every turn. The real heart of a community is its people—so get yours excited and activated, and they’ll do their part in creating the sense of place you want and need.